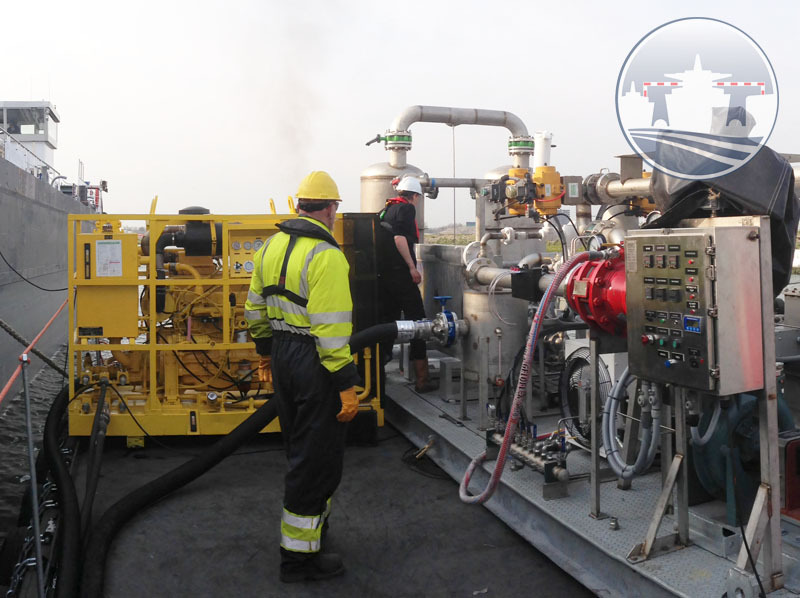 MariFlex MVRU-1100 solves degassing and VOC emission problems for inland barges. Now the trans-shipment between inland tankers and sea going vessels will go a lot faster and safer. Thanks to the Mobile Vapour Recovery Unit (MVRU-1100) of Vlaardingen based company MariFlex. The mobile unit was flown in from America in 2012 and has been modified and made operational in order to assist terminals and inland barges degas without polluting the atmosphere. Utilising nitrogen in the process means that tanks can be degassed and inerted in the same operation. The VCRS MVRU – 1100 tackles the ever present challenge to the petrochemical industry, especially tanker operators and barge operators, to comply with ‘green’ incentives and reduce emissions. Especially trans-shipments between Sea-going vessels and Inland barges have been in the sights of Port authorities and Environmental agencies alike. Sea going ships are inerted to less than 8% oxygen in their tanks. Barges are often not inerted, making them incompatible with inerted ships when vapour balancing. During transfers between ships and noninerted barges the MVRU – 1100 serves to capture VOC’s from the barge and control vapour emissions. By deploying the MVRU harmful emissions and vapour from sea vessels and inland barges can be reduced to a level that complies fully with existing environmental regulations. Emissions of gaseous, sometimes smelly gases to the atmosphere may be a thing of the past as more operators utilise the MVRU. The MVRU is capable of inerting tank atmospheres as it removes gassy vapours. Inerting barges with nitrogen makes oil transfers between ships and inland barges safer and enables petroleum vapours to be kept within the cargo tanks using a process called ‘Vapour Balancing’. MariFlex engineers, using their own knowledge and expertise, have further modified the installation in order to meet emission requirements. At the moment the MVRU can process 1100 cubic meters of gas an hour and extract 99,9 percent of all hydrocarbons. MariFlex wants to be the company to really solve the problem of degassing ships and also hopes to speed up trans-shipment between sea vessels and inland barges in port. At its location at Zevenmanshaven MariFlex owns a 70 meter long jetty, where gas free inland tankers can be inerted. Other potential clients are terminals, inland barges and vessels that are required to be gas free and inert prior to proceeding to dry-dock for repair. The MVRU draws all the vapours out of the ship and pushes them through a condenser that uses non-polluting cold nitrogen to liquefy the gasses in order to capture them. VOC emissions are reduced to the required state regulation levels. Having the size and dimension of a 20 feet TEU container and weighing ‘just’ 3000 kilo, the unit is mobile and can be deployed quickly. 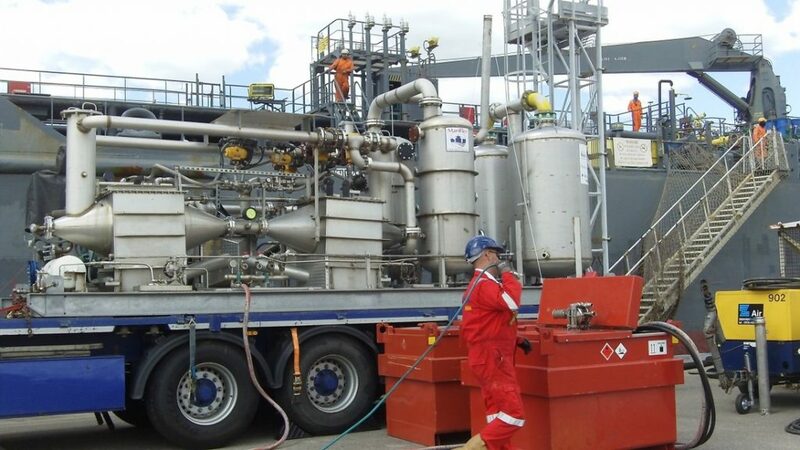 The technique of refrigerated vapour recovery is developed by an American company and improved and adapted for the European market by the MariFlex Group. The MVRU – 1100 is typically accompanied by one of our specialized Supervisors to ensure safe and experienced operation of the unit. Additional associated equipment can also be hired from VCRS International. This project is supported by the “Zeehaven Innovatie Project“.